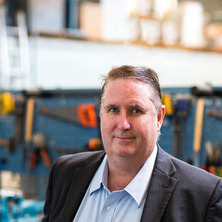 Professor Ross McAree is Head of the School of Mechanical and Mining Engineering at the University of Queensland. His research interests are focused on machinery dynamics and control with a current emphasis on mining equipment automation.. Professor McAree led the development and demonstration of the world’s first fully autonomous mining excavator as the outcome of a 10year collaboration with Joy Global Surface Mining (now part of Komatsu) and has collaborated with Caterpillar Inc. to develop and trial the world’s first autonomous bulldozer capable of production dozing using the ‘pivot push’ method. From 2007-2015 Professor McAree held an industry funded (P&H) Chair in Mechanical Engineering and from 2009-2015 he was Vice President for Automation and Automation Program Leader with the Cooperative Research Centre for Mining. He has attracted in excess of $12M dollars of Category 1-3 and $8.5M of Category 4 funding has contributed to the winning of two CRC bids (CRCMining and CRCMining2) for a total of $35.2M funding. He established the Mechatronic Engineering Plan at UQ in 2002. He has given leadership to his School as Chair of Research Committee (2009-2015) and Teaching and Learning Committee (2015-2017). Significant external service includes serving as Chair for the Australian Academy of Science National Committee on Mechanical Sciences (2001-2006) and as the Australian representative to the International Federation of Mechanism and Machine Theory (2001-continuing), Associate Editor for journal ‘Mechatronics’ (1999-2011) and member of Australian Standards Committees ME-27 and IT-06P. Professor McAree is a fellow of the Australian Academy of Technology and Engineering (ATSE). Professor McAree's research group have been involved in the development of several automation technologies for the mining sector which have been commercialized. The outputs have been estimated to have had benefit to the global mining industry of in excess of $1000m. Real-time mining face grade determination using hyperspectral imaging techniques. Optimal mission plans for autonomous agents. Dight, P. M., Douglas, B., Henley, K., Lumley, G., McAree, P. R., Miller, D., Saydam, S., Topal, E., Wesseloo, J. and Williams, D. J. (2013). Developments in open cut mining. In W. J. Rankin (Ed. ), Australasian mining and metallurgical operating practices 3rd ed. (pp. 47-80) Carlton, VIC, Australia: Australasian Institute of Mining and Metallurgy. Daniel, R. W., Fischer, P. J. and McAree, P. R. (1996). Force Feedback and its applications to decommissioning. In J. O. Gray and D. G. Caldwell (Ed. ), Advanced robotics and intelligent machines (pp. 71-88) Bath, United Kingdom: Institution of Electrical Engineers. Hook, D. G, and McAree, P. R (1990). Using Sturm sequences to bracket real roots of polynomial equations. In Andrew S. Glassner (Ed. ), Graphics gems (pp. 416-422) Boston, United States: Academic Press. Job, Andrew Todd and McAree, Peter Ross (2017) Common factors in the implementation of new technology in the mining industry. AusIMM Bulletin, June 2017: 24-26. How do ICP variants perform when used for scan matching terrain point clouds? Skills Development for a Low Carbon Econom - Mining. A report prepared for the Mining Industry Skills Centre. McAree, P. R. (2010) Functional safety: an indispensible prerequisite for mining automation. Australasian Mine Safety Journal, 3 1: 24-24. McAree, Ross and Long, Andrew (2007) A better measuring system. AusIMM Bulletin, 3: 38-39. Job, Andrew, Edgar, Michael and McAree, Peter R. (2017). Real time shovel-mounted coal or ore sensing. In: Belle Dolery, Ross Palmer, Kelly Steele and Mia Wotherspoon, Iron ore 2017: building resilience. Iron ore 2017, Perth WA, Australia, (397-406). 24-26 July 2017. Job, Andrew and McAree, Peter R. (2017). Three case studies on the implementation of new technology in the mining industry. In: Belle Doley, Ross Palmer, Kelly Steele and Mia Motherspoon, Iron ore 2017. Iron ore 2017, Perth WA, Australia, (407-414). 24-26 July 2017. Kearney, Michael P., Rakovic, Sasa V. and McAree, Peter Ross (2014). Control correction synthesis: A set-theoretic approach. In: 2009 10th European Control Conference, ECC 2009, Budapest, , (3130-3135). August 23, 2009-August 26, 2009. Phillips, Tyson, Hahn, Martin and McAree, Ross (2012). An evaluation of ranging sensor performance for mining automation applications. In: Proceedings of the 2012 Australian Mining Technology Conference. 2012 Australian Mining Technology Conference, Perth, WA, Australia, (185-200). 8-10 October 2012. Edgar, Michael, Aw, Jonathan, Dudley, John, Marley, Roger, Reid, Anthony, Smith, Zane, Taylor, Adrian and McAree, Ross (2012). Characterization of a UWB transceiver for mining applications. In: Proceedings of the 2012 Australian Mining Technology Conference. 2012 Australian Mining Technology Conference, Perth, Australia, (125-140). 8-10 October 2012. Green, Matthew, Ridley, Alexander and McAree, Peter R. (2012). Pose verification for mining automation applications. In: Proceedings of the 2012 Australian Mining Technology Conference. 2012 Australian Mining Technology Conference, Perth WAPerth, Australia, (113-124). 8-10 October 2012. Beasley, Peter M. and McAree, Peter R. (2012). The tactical movement problem: solution by linear relaxation. In: Proceedings of the 2012 Australian Mining Technology Conference. 2012 Australian Mining Technology Conference, Perth, Australia, (175-184). 8-10 October 2012. Dudley, John, Palmer, Lachlan and McAree, Ross (2012). Towards a reference architecture for mining automation. In: Proceedings of the 2012 Australian Mining Technology Conference. 2012 Australian Mining Technology Conference, Perth, Australia, (49-62). 8-10 October 2012. Beasley, Peter M. and McAree, Peter R. (2010). The tactical movement problem. In: Bevan B. Beamish and David Cusack, Proceedings of the 2010 Australian Mining Technology Conference: Technology Changing the Mining Business Footprint. 2010 Australian Mining Technology Conference, Perth, WA, Australia, (21-34). 13-15 September 2010. Dudley, John, McAree, Peter R., Lever, Paul J.A., Jones, D. and Sprigg, M. (2010). Trade-level skills formation to support automation in the mining industry. In: Sustainable Mining 2010 conference : 17-19 August 2010, Kalgoorlie, Western Australia. Sustainable Mining 2010- The Business Case, Kalgoorlie, Western Australia, (296-306). 17-19 August. Dudley, John and McAree, Peter R. (2010). Underground collision avoidance: From technology to solution. In: Paul Lever and Peter Knights, Proceedings of the 2010 Australian Mining Technology Conference: "Technology Changing the Mining Business Footprint". 2010 Australian Mining Technology Conference: "Technology changing the mining business footprint", Perth, WA, Australia, (9-19). 13-15 September 2010. Michael Kearney, Zane Smith and McAree, Peter R. (2009). A Constrained Control Methodology to Assist Operators of Mining Shovels to Avoid Collisions. In: Knights, Peter and Lever, Paul J.A., Technology solutions for challenging financial times. Australian mining technology conference, Brisbane Australia, (31-44). October 27-28 2009. Kearney, Michael Peter, Rakovic, Sasa V. and McAree, Peter Ross (2009). Control correction synthesis: A set of theoretic approach. In: Proceedings, European Control Conference 2009. European Control Conference 2009, Budapest, Hungary, (3130-3135). 23-26 August, 2009. Williams, I., Upcroft, B., Denman, A., Reid, A. and McAree, P.R. (2009). Range sensor pose estimation. In: Knights, P. and Lever, P., Technology solutions for challenging financial times. Australian Mining Technology Conference, Brisbane, (55-66). Victoria, Australia. Matthew Green and McAree, Peter R. (2009). Relative Vehicle Localisation in Surface Mining. In: Knights, Peter and Lever, Paul J.A., Technology solutions for challenging financial times. Australian mining technology conference, Brisbane Australia, (19-30). October 27-28 2009. Dudley, John, McAree, Peter R., Lever, Paul J.A., Jones, D. and Sprigg, M. (2009). Skills formation to support the future of automation in the resource industry. In: Knights, Peter and Lever, Paul J.A., 2009 Australian Mining Technology Conference. 2009 Australian Mining Technology Conference, Brisbane, Australia, (11-18). 27-28 October 2009. Williams, I. A. and McAree, P. R. (2008). Situational awareness for automated operation of electric mining shovels. In: Michael Hood, Peter Knights and Paul Lever, "Smart technologies for sustaining the minerals boom" : 16-18 September 2008 Twin Waters, Queensland. 2008 Australian Mining Technology Conference, Sunshine Coast, Australia, (57-70). 16-18 September 2008. Green, M., Williams, I. and McAree, P. R. (2007). A framework for relative equipment localisation. In: M. Hood, P. Knights and P. J. A. Lever, Proceedings of: 2007 Australian Mining Technology Conference. 2007 Australian Mining Technology Conference, The Vines, Western Australia, (317-331). 2-4 October, 2007. McAree, P. R., Burant, J. and Austin, K. J. (2007). Developments in mining shovel automation. In: M. Hood, P. Knights and P. J. A. Lever, Proceedings of the 2007 Australian Mining Technology Conference. 2007 Australian Mining Technology Conference, The Vines, Western Australia, (97-103). 2-4 October, 2007. Austin, K. J., Champion, M. and McAree, P. R. (2007). Progress in multi-boom jumbo sequencing. In: Smart technologies for overcoming the skills shortage. 2007 CRC Australian Mining Technology Conference, The Vines, Western Australia, Australia, (). 2-4 October 2007. McAree, P. R. and Austin, K. J. (2007). Realtime friction estimation using the Kalman Inverse Filter. In: Twelfth World Congress in Mechanism and Machine Science : Besançon, France, June 17 - 21, 2007. Twelfth World Congress in Mechanism and Machine Science, Besançon, France, (). 17-21 June, 2007. Green, M., Siegrist, P. M., Calder, M. and McAree, P. R. (2006). A method for globally locating electric mining shovels. In: Hood, Mike, Lever, Paul and Knights, Peter, Value through cost control. 2006 Australian Mining Technology Conference, Hunter Valley, Australia, (199-213). 26-27 September, 2006. Austin, K. and McAree, P. (2006). Characterising transmission friction in the 2100BLE electric mining shovel. In: Hood, Mike, Lever, Paul and Knights, Peter, Value through cost control. 2006 Australian Mining Technology Conference, Hunter Valley, Australia, (125-132). 26-27 September, 2006. Kearney, M. P., Siegrist, P. M. and McAree, P. R. (2006). Constrained model predictive control for obstacle avoidance in rate-controlled systems. In: Mike Hood, Paul Lever and Peter Knights, 2006 Australian Mining Technology Conference: Value through cost control, Hunter Valley, Australia, (287-300). 26-27 September, 2006. Wallis, D. L., Jefferey, R., Siegrist, P. M. and McAree, P. R. (2006). Control systems modelling of a 2100BLE electric mining shovel. In: Hood, Mike, Lever, Paul and Knights, Peter, 2006 Australian Mining Technology Conference:'Value through cost control'. 2006 Australian Mining Technology Conference: 'Value through cost control', Hunter Valley, Australia, (105-118). 26-27 September, 2006. Smith, Z. V. and McAree, P. R. (2006). Fast Minkowski hull operation. In: Mike Hood, Paul Lever and Peter Knights, Proceedings of the 2006 Australian Mining Technology Conference. 2006 Australian Mining Technology Conference: Value through cost control, Hunter Valley, NSW, Australia, (427-438). 26-27 September, 2006. Walls, L. D. and McAree, P. R. (2006). Monitoring underground road roughness. In: Hood, Mike, Lever, Paul and Knights, Peter, Value through cost control. 2006 Australian Mining Technology Conference, Hunter Valley, Australia, (25-40). 26-27 September, 2006. Champion, M., Austin, K. and McAree, P. R. (2006). Optimal drill pattern sequencing for multi-boom jumbos. In: Mike Hood, Paul Lever and Peter Knights, Proceedings of the 2006 Australian Mining Technology Conference. 2006 Australian Mining Technology Conference: Value through cost control, The Hunter Valley, NSW, Australia, (125-132). 26-27 September, 2006. Siegrist, P. M., McAree, P. R., Wallis, D. L., Kearney, M. P. and van Geenhuizen, J. A. (2006). Prediction models for collision avoidance on electric mining shovels. In: Mike Hood, Paul Lever and Peter Knights, Proceedings of the 2006 Australian Mining Technology Conference. 2006 Australian Mining Technology Conference: Value through cost control, The Hunter Valley, NSW, Australia, (161-174). 26-27 September, 2006. Smith, Z. V. and McAree, P.R. (2005). A distributed data-representation for facilitating equipment interactions. In: H Gurgenci, M Hood, P Lever and P Knights, 2005 Australian Mining Technology Conference - New Technologies to Produce More with Less. 2005 Australian Mining Technology Conference, Fremantle, Australia, (49-56). 27-28 September 2005. Reid, A. W., Chiodi, V., Hall, A. S. and McAree, P. R. (2005). A performance evaluation of the CRCMining/P&H electric mining shovel monitor. In: H. Gurgenci, M. Hood, P. Lever and P. Knights, Proceedings of the 2005 Australian Mining Technology Conference. Australian Mining Technology Conference - New Technologies to Produce More with Less, Fremantle, Western Australia, (165-173). 27-28 September, 2005. Austin, K. J., Calder, M. A. and McAree, P. R. (2005). Machine monitoring with wireless sensor networks. In: H. Gurgenci, M. Hood, P. Lever and P. Knights, 2005 Australian Mining Technology Conference - New Technologies to Produce More with Less. Proceedings of the 2005 Australian Mining Technology Conference, Freemantle, Western Australia, (279-284). 27-28 September 2005. Kearney, M. P. and McAree, P.R. (2005). Real-time collision prediction and control system for electric rope shovels. In: H Gurgenci, M Hood, P Lever and P Knights, 2005 Australian Mining Technology Conference - New Technologies to Produce More with Less. Proceedings of the 2005 Australian Mining Technology Conference, Freemantle, Western Australia, (113-120). 27-28 September 2005. Hillier, N. S. and McAree, P.R. (2004). Computer modelling of the dynamics of the RH200 hydraulic excavator. In: H Gurgenci, A Hall, D Howarth, P Lever, T Meyer and E Nebot, Proceedings of the 2004 CRCMining Research and Effective Technology Transfer Conference. CRCMining Conference, Noosa Head, Queensland, Australia, (1-8). 15-16 June 2004. Barter, B. S. and McAree, P.R. (2004). Longwall AFC Operating Regime Identification using the IMM Estimator. In: H Gurgenci, A Hall, D Howarth, P Lever, T Meyer and E Nebot, Proceedings of the 2004 CRCMining Research and Effective Technology Transfer Conference. CRCMining Conference, Noosa Head, Queensland, Australia, (1-10). 15-16 June 2004. Siegrist, PM and McAree, PR (2004). Sensor requirements for tyre force estimation applications to off-highway mining trucks. In: Huang, T, 11th World Congress in Mechanism and Machine Science, Tianjin Peoples R China, (2297-2301). Apr 01-04, 2004. Siegrist, P. M. and McAree, P. R. (2004). Sensor requirments for tyre force estimation; Applications to off-highway mining trucks. In: T Huang, Proceedings of the 11th World Congress in Mechanism and Machine Science. 11th World Congress in Mechanism and Machine Science, Tianjin, China, (2397-2301). 18-21 August 2003. Gurgenci, H., McAree, R., Meehan, P. and Guan, Z. (2002). How to Manage Machine Duty to Sustain High Production Rates. In: CMMI Congress 2002 - International Codes, Technology and Sustainability for the Minerals Industry. CMMI Congress 2002 - International Codes, Technology and Sustainability for the Minerals Industry, , , (135-139). May 27, 2002-May 28, 2002. Hillier, N. S. and McAree, P.R. (2002). Formulating the equations of motion for mechanisms having multiple kinematic loops. In: Pemberton, M. Turner, I. Jacobs, P. and ., The Fifth Biennial Engineering Mathematics and Applications Conference. The Fifth Biennial Engineering Mathematics and Applications Ce, Queensland University of Queensland, Brisbane, (121-126). 29/09/02-02/10/02. Gurgenci, H., McAree, P.R., Meehan, P. A. and Guan, Z. (2002). How to manage machine duty to sustain high production rates. In: Clifford and L., CMMI Congress 2002 - International Codes, Technology and Sustainability for the Minerals Industry. CMMI Congress 2002, Cairns, Queensland, Australia, (135-140). 27-28 May, 2002. Barter, B. S. and McAree, P.R. (2002). Performance analysis of fault detection and isolation techniques. In: Pemberton, M. Turner, I. Jacobs, P. and ., The Fifth Biennual Engineering Mathematics and Applications Conference. The Fifth Biennual Engineering Mathematics and Applications Ce, Queensland University of Technology, Brisbane, (79-84). 29/09/02 - 02/10/02. Siegrist, P. M. and McAree, P.R. (2002). Sensor requirements for tyre force estimation; Applications to off-highway mining trucks. In: P. Pemberton, M. Turner and I. Jacobs, The 5th Biennial Engineering Mathematics and Applications Conference. The 5th Biennial Engineering Mathematics and Applications Ce, Queensland University of Technology, Brisbane, (187-192). 29 September - 2 October, 2002. Siegrist, P. M., McAree, P. R. and Gurgenci, H. (1999). The interaction between mining trucks and haul roads. In: Hal Gurgenci and Jimin He, International Conference on Applications of Modal Analysis '99: Recent Advances in Modal Analysis Practice. Recent Advances in Modal Analysis Practice, Gold Coast, Qld, Aust., (74-87). 15-17 Dec 1999. Selig, JM and McAree, PR (1996). A simple approach to invariant hybrid control. In: 1996 Ieee International Conference On Robotics and Automation, Proceedings, Vols 1-4. 1996 IEEE International Conference on Robotics and Automation, Minneapolis Mn, (2238-2245). Apr 22-28, 1996. Bu, YH, Daniel, RW and McAree, PR (1996). Stability analysis of force reflecting telerobotic systems. In: Iros 96 - Proceedings of the 1996 Ieee/rsj International Conference On Intelligent Robots and Systems - Robotic Intelligence Interacting with Dynamic Worlds, Vols 1-3. 1996 IEEE/RSJ International Conference on Intelligent Robots and Systems - Robotic Intelligence Interacting with Dynamic Worlds (IROS 96), Osaka Japan, (1374-1379). Nov 04-08, 1996. McAree, Peter R. and Kearney, Michael (2014). Collision avoidance system and method for human commanded systems. US13883617. McAree, Peter R., Reid, Anthony, Siegrist, Paul M. and Austin, Kevin J. (2011). Method for position-calibration of a digging assembly for electric mining shovels. US8515708B2 (Grant). McAree, Peter R. and Reid, Anthony (2010). Real time method for determining the spatial pose of electric mining shovels. US8571762B2. McAree, Peter R. (2010). Collision avoidance for electric mining shovels. US8346512B2. McAree, Peter Ross and Wauge, David Herman (2009). Payload estimation system and method. US 2009/0187527 A1.